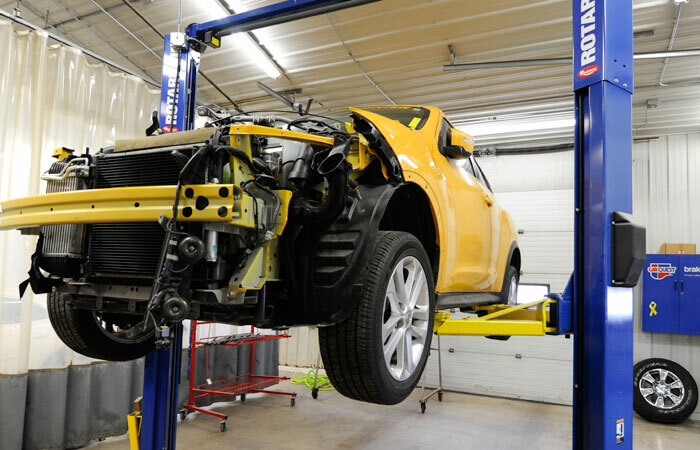 Our professional auto body repair and painting services are second to none in the Eau Claire & Chippewa Falls region. We can finish and paint your industrial and commercial truck bodies, trailers and emergency vehicles up to 40 feet in length. With our high bay service & paint building we can repair & paint semi tractors & trailers up to 40 feet long. Let us refinish and repaint your sailboat, bass fishing boat, house boat or water skiing boat with a like new finish. We repair and paint accident damaged powered recreational vehicles, 5th wheel campers and RV trailers. Collision Center Inc. provides a protective shipping coating that can be applied to most any piece of manufactured equipment. With over 22 years of experience we are eager to fulfill your auto body collision repair, auto paint and custom painting requirements. Our two buildings offer a combined 10,000 square feet of work space, including several high bay prep & spray paint service bays, allowing us to accommodate projects up to 45 feet in length. We have the latest tools, equipment and training to ease you through the process from collision estimate, auto body repair & painting, loaner vehicle and insurance claim processing. We're looking forward to taking care of all your vehicle repair needs from minor repairs to major structural auto frame damage. Closed: Thanksgiving Day and the day after, Christmas Day and New Years Day.